I had to make another trip to chicago, and my first night there, I stayed in the northern burbs. We were both starving so we decided to go eat right away, even though it was hella early for dinner time. Who cares. When I’m hungry, I need immediate sustenance! 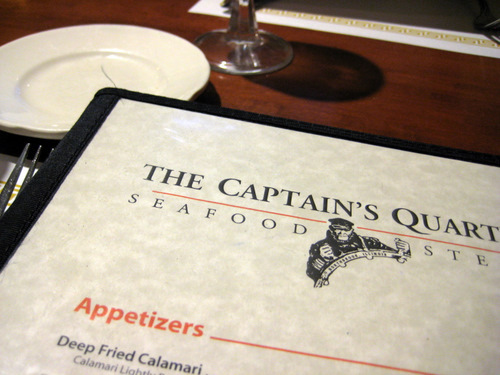 I saw some good reviews for The Captain’s Quarters, which was about 50 yards up the street, so we headed there. This place is corn and kitsch, personified, but I loved it. It’s a fisherman’s theme all the way, and hilarious, with stuffed fish everywhere, awesome oil paintings of ship captains, with pipes and all. You have to love those chairs! 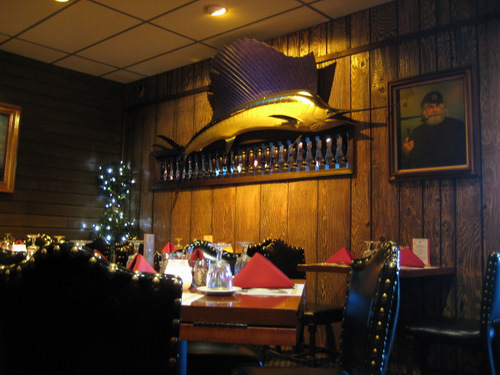 Yes, it’s a seafood restaurant, but you can get your typical turf dishes as well. Judging by the menu, this place is run by greeks, so you can even get some greek dishes, as well as many pasta dishes. You get a side salad with any entree. 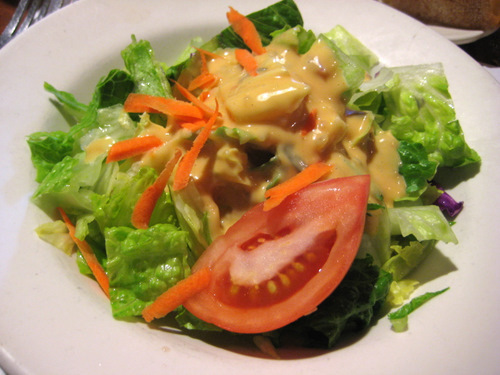 There was nothing exciting about this salad, but I was happy to eat some fresh greens. 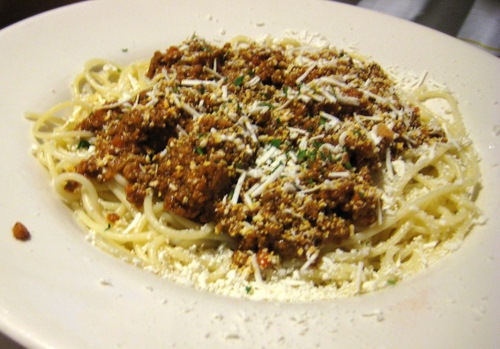 J got the pasta bolognese, and he loved it. He cleaned his plate! I got the pasta with shrimp in lobster sauce. 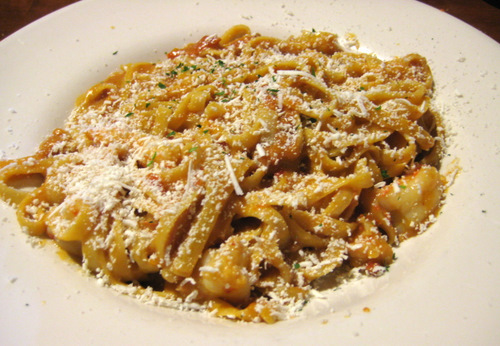 It was thick fettuccini with large grilled shrimp, tossed in an incredibly rich lobster sauce. This was very good, but it was beyond rich! It was as if they took super thick lobster bisque and basically used that as a sauce. It was very tasty, but probably not for everyone. Subtle it is not! And it was a giant bowl, so I had plenty left over. Since it was so early, there were very few of us there, just the early birds, and our server was super nice and friendly. If you’re ever up in these parts, definitely go check it out!